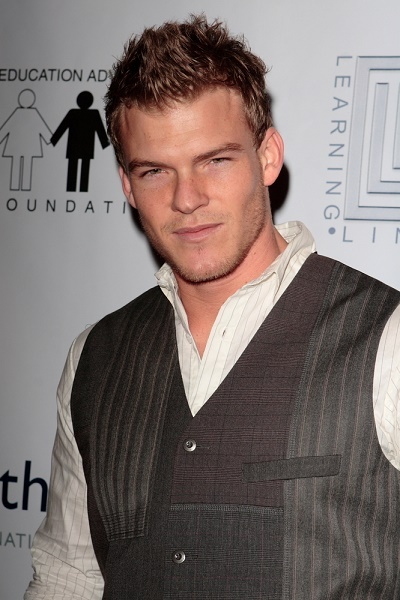 Alan Ritchson is an American actor, model, and singer. Alan’s paternal grandfather is Charles Marvin Ritchson (the son of Clifton Marvin Ritchson and Hettie/Hattie Marie Collinsworth). Clifton was the son of John P. Ritchson and Allie/Arizona Heavren. Hettie was the daughter of James Robert Collinsworth and Ida May Sloan. Alan’s paternal grandmother is Claudette S. Schweingruber (the daughter of John Edward Schweingruber/Schweingrober/Schweingrouber and Helen Louise Mohring). John was the son of John Edward Schweingruber and Lucille “Lucy” Marie France. Alan’s maternal grandfather is Robert Eugene Harrell (the son of Adrian Ancil Harrell and Inez Marie Porter). Adrian was the son of Ross D. Harrell and Dessie Pearl Elea. Inez was the daughter of Owen N. Porter and Daisy Ann Meek. Alan’s maternal grandmother is Barbara Jean Guidos (the daughter of Stephen Andrew Guidos and Veronica W. Kamick). Stephen and Veronica were of Czech origin. Stephen was the son of Alexander Guidos and Maria Hriczisak.